"The Stolen Moments," a photo exhibition documenting three men and one woman's unusual journey beyond the world's northernmost settlement, is now open at the Qiwi Group building on Petrovsky Pereulok. 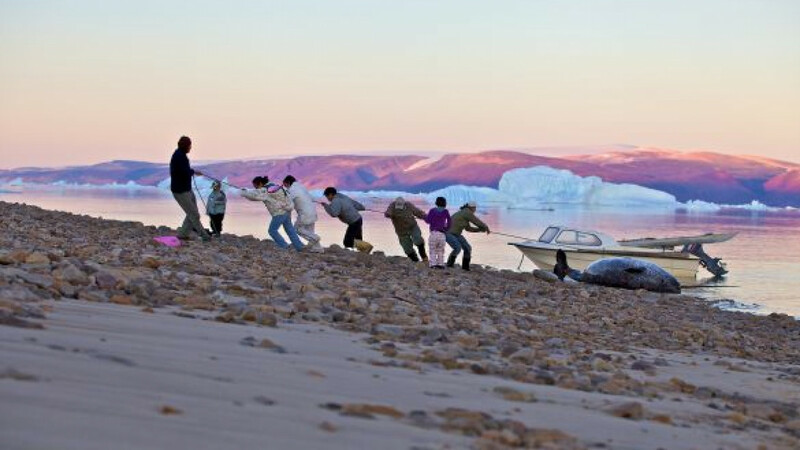 Expedition Avannaa (the word for "north" in the Greenlandic language) was the first joint venture of Russian and Greenlandic explorers in the Arctic, meant to offer a glimpse into the world of Greenland's Polar Eskimos as they themselves see it. "We did not travel to conquer, nor to proclaim superiority", said Galya Morrell, a Russian-born crew member and cultural activist whose photos are on show and who lives in Greenland. "Unlike many fact-finding missions that only stay in Greenland for a few days, we spent over two months traveling the Greenlandic way." This meant a journey of over 4,000 kilometers in an open boat, with no specialist equipment and few means of communication with the outside world. The crew, made up of Morrell and three Greenlandic Eskimo hunters, sailed from Uummannaq Island (often called "the heart of the Arctic") to the country's "Ultimate North," far beyond human settlement. "It wasn't easy," Morrell said. "We had to deal with eight broken bones and several open wounds on our way, relying on the most basic methods of treatment. What kept us going was our belief in principles that inform the Greenlandic way of life: wander, accept, and adapt." However, the lifestyle and traditions of Northern Greenlandic peoples are now seen as increasingly in danger, said Morrell, whose ancestors were a family of caribou herders in the Russian North, as climate changes threaten Polar Eskimo culture. "The melting of sea ice in the North means that hunters are no longer able to provide for their families," she said. "Whole villages are thus forced to emigrate to the south, leaving their customs and beliefs behind." With "The Stolen Moments," Morrell has tried to capture some of these customs and beliefs. Scenes from Greenlanders' everyday life feature alongside the landscapes of Uummannaq, the "town of icebergs," Ilulissat and the red sea waves of Nekip Aqia. The photographer identifies the "Greenlandic values" of hospitality, communality and mutual assistance as one common thread running through the hunting, familial and work scenes. Another concern that Avannaa participants have been trying to address is the alarming suicide rate among Greenland's youth. One initiative is Morrell's Uummannaq Music project, involving workshops by Western musicians for Eskimo children and the construction of the world's northernmost stage on drifting sea ice. Another member of the crew, explorer Ole Jorgen Hammeken, is often referred to as Greenland's national hero because of his work with orphaned children. He and his wife operate a children's home in Uummannaq that works with Morrell's music project. "The key is to help the children recover their sense of self-worth," Morrell said. Children themselves are a major theme of the exhibition with Morrell's poignant portraits of young Eskimo girls. "You will not get this look anywhere else," the photographer said of one of the images. "There is such purity in it. Here you can find everything you want to know about us and our expedition." "This initiative shows that Russia and Greenland can work together toward raising awareness of the problems of the North," said Arthur Chilingarov, distinguished Russian polar explorer and politician, who was a special guest at the opening. "They are not and need not be enemies." He also praised the personal contribution of Morrell, whom he met 25 years ago at an Arctic research station. "Galya was the heart and soul of this expedition," he said. "She is a truly remarkable woman." "The Stolen Moments" runs till Oct. 26. Qiwi Group site. QIWI Group,. 10 Petrovsky Pereulok. Metro Pushkinskaya. Tel. +7 (916) 134-41-87.